Peace One Day discussions, conversations and documentary screenings will begin at 08:00 GMT on Facebook so feel free to tune in. Show us how you’re celebrating the Peace Day by tagging us @F4PValues on our Instagram, Facebook and Twitter accounts, and by using hashtag #PeaceDay. The Peace One Day broadcast will feature some very high level guests, including Ahmad Fawzi (Former Director UN News and Media) Maher Nasser (Director, Outreach Division, UN Department of Public Information) and Melissa Fleming (Communication Director and Spokesperson, UNHCR), Nick Fraser (Editor of Storyville, the BBC’s documentary strand, Founder of Yaddo) and John Battsek (Oscar-winning Filmmaker, UK’s most successful Documentary Film Producer), as well as Jude Law. 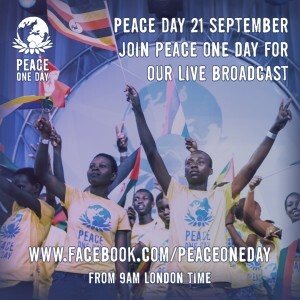 F4P will take part in the live conversation on the role of sport in peacebuilding with Eric Murangwa (Rwandan genocide survivor, former captain of the Rwandan football team, and founder of FHPU) and Dr. Holly Collison (Research Associate at Loughborough University with a focus on the use of sport as a catalyst for peace in West Africa). There will be screening of the Peace One Day Sport documentary. We’d love to hear what you think so tune in! While Tweets and Facebook posts will not bring the world peace, they are an important tool to spread the world, raise awareness and particularly reach out to younger generations. This entry was posted in F4P Events, Sport for Development & Peace by Graham Spacey. Bookmark the permalink.